John Henry Bass built the Bass Mansion in Fort Wayne, Indiana during the 1880s as the centerpiece of his country estate. After fire destroyed the first home, he rebuilt in 1903. 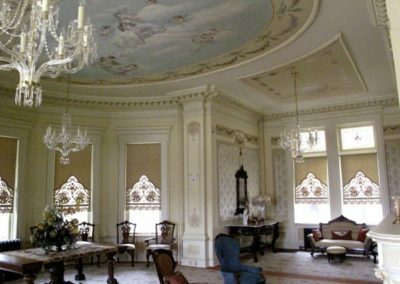 The mansion contains elaborate stenciling, murals, decorative plasterwork, intricate woodwork, fine artwork, valuable antiques and elegant furnishings. 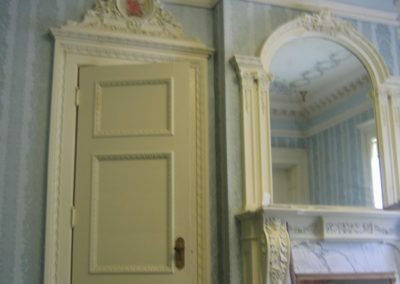 Each diversely themed room presented a unique challenge in terms of existing condition, decorative style and the lack of clues left behind to guide an accurate conservation and restoration of the original decoration. 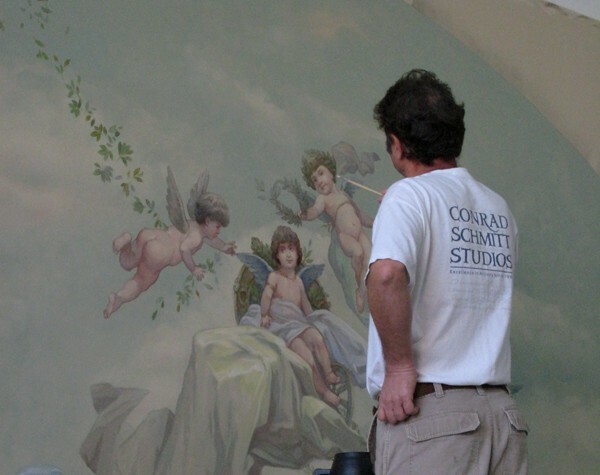 Conrad Schmitt Studios restoration of the historic Bass Mansion, or “Brookside” as it was originally named, includes period conservation and replication of the ornate decorative painting and stencil work. 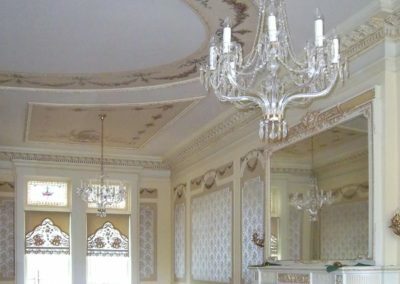 The comprehensive restoration and aggressive homecoming of original and elegant new decoration celebrates and revives the Bass Mansion’s unique decorative and cultural legacy. 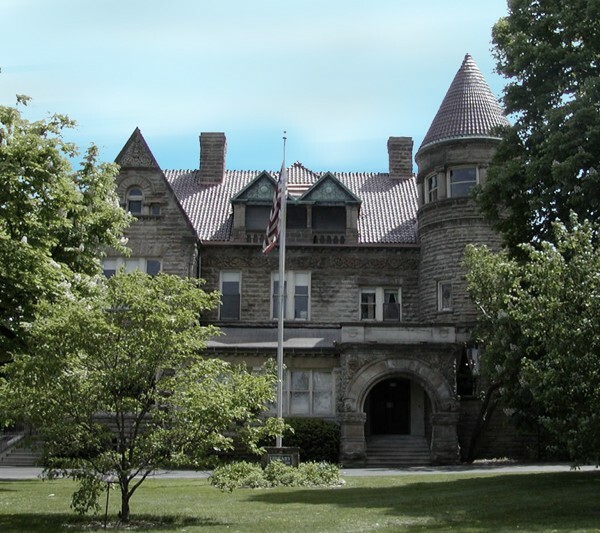 The Sisters of Saint Francis of Perpetual Adoration bought the home from the Bass family in 1944 and relocated their college. 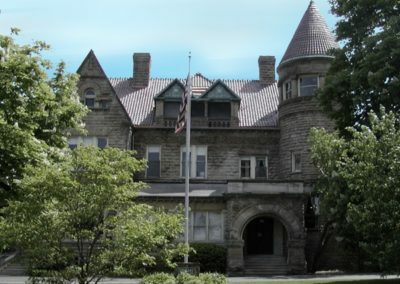 Since 1944, the mansion served as library and residence to the college. 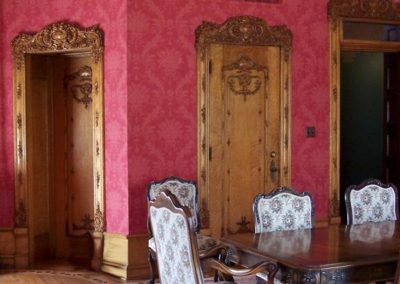 Virtually all record of its former glory has been worn out or covered over by decades of utility, inconsistent decorative restoration and spotty repairs. Restoration challenges cropped up early. After jute and linen was removed, considerable wall preparation was required to remove adhesives before a polymer fiberglass wall system, primer, and finishes could be applied. Jute and linen encased the plaster walls on each of the three stories. The once abundant and inexpensive materials have lost favor because of their short life span, lack of availability and high cost. 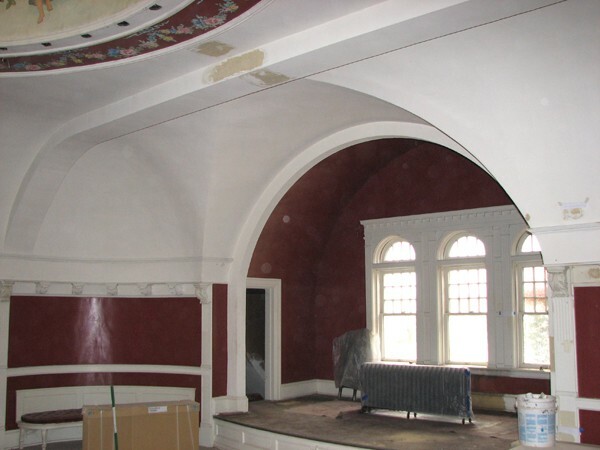 Flat plaster walls and ceilings received Hallman Lindsay Polymer Wall Restoration System (fiberglassing). 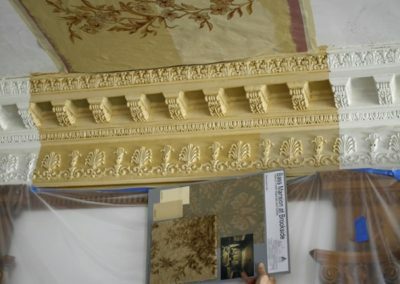 Next, an extensive series of decorative samples illustrated how restoration and conservation would bring original decorations back to life. 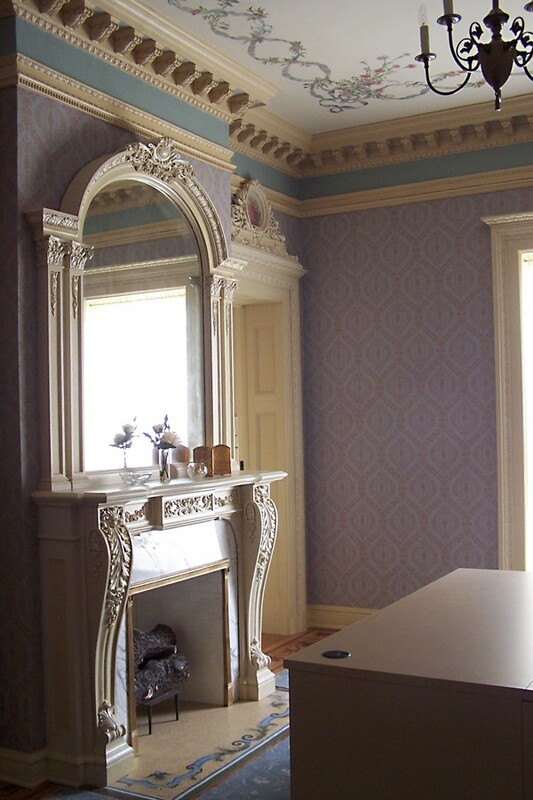 Decorative samples foster the support needed to ensure a successfully completed project. 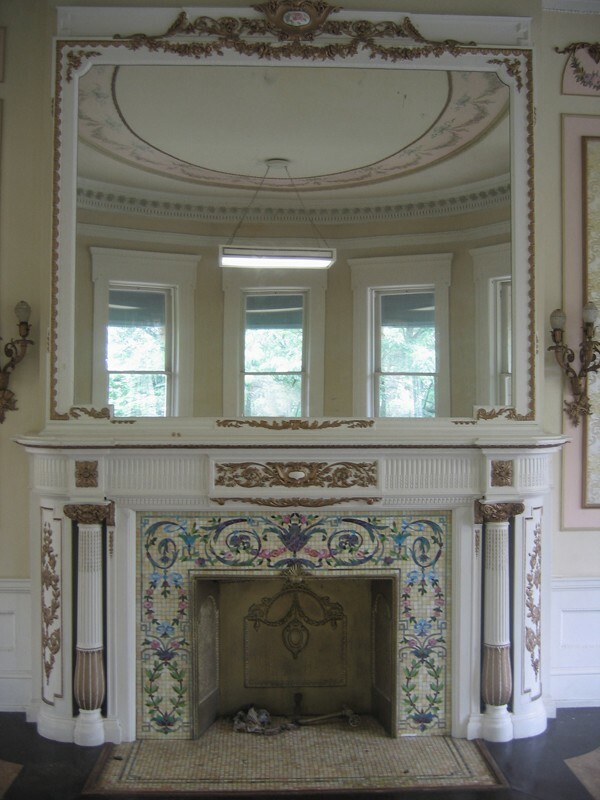 In the case of the Bass Mansion, the numerous samples throughout this facility established solidarity of artistic vision between the many parties involved with this restoration including, patrons, the architect, and Conrad Schmitt Studios. 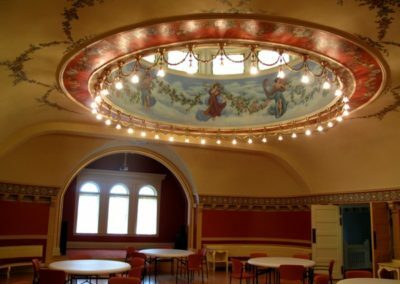 Historic black and white photographs revealed the central ceiling mural in the first floor Meeting Room had been painted over at some time in recent history. The photos served not only as a glimpse of what once was, but to the Studio’s modern artists, a vision of what would again be. The canvas was removed and cleaned of layers of paint, revealing the original scene. Badly deteriorated mural fabric forced painting a new mural on canvas and installing it back to its original intent. 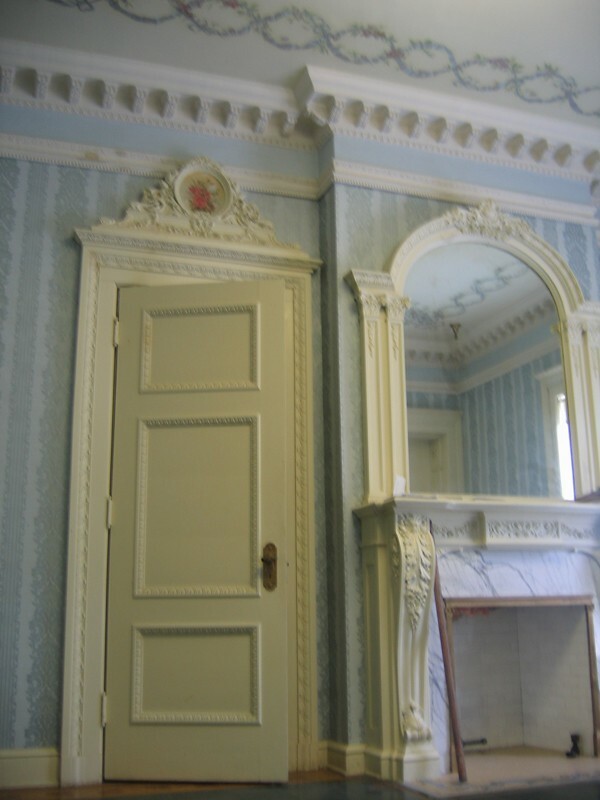 The Moorish Room contains two original decorative stencils. 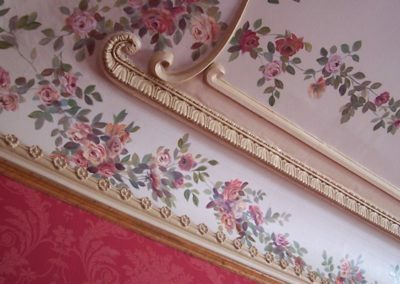 The gilding and glazing of the ceiling cove and upper wall stencils had drastically muted with age. 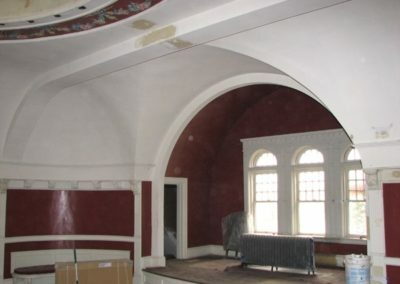 Compounding the issue, inappropriate paint color had been cut into the ceiling stencil. 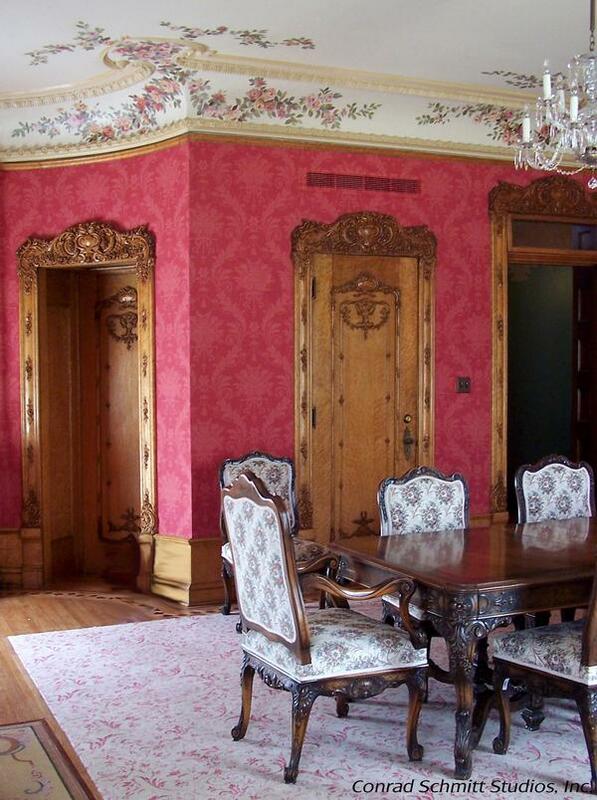 The paint color was corrected and each stencil replicated to bring out the beauty of the original decoration. 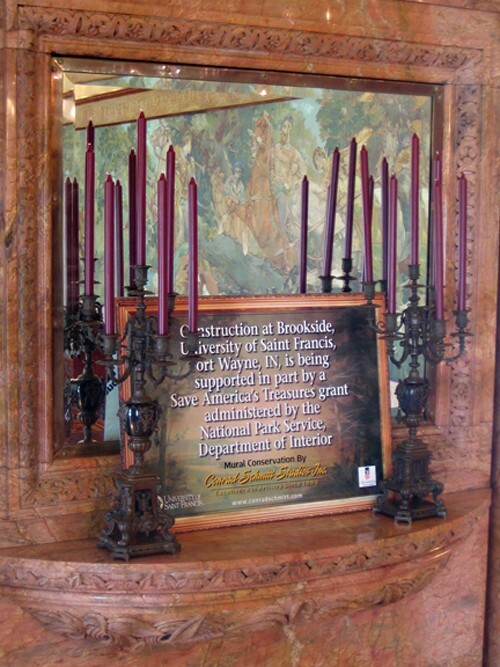 Original murals surrounding the Dining Room were conserved and finished with a reversible barrier varnish. 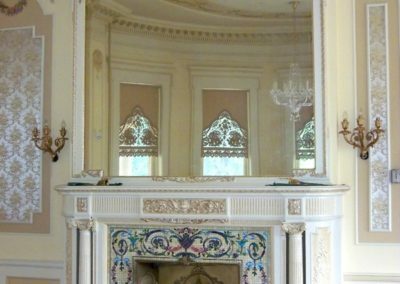 Exposure windows revealed the cove stencil, ceiling and molding decoration had been altered by a pastiche of decorative attempts throughout the years. The existing stencils (oak leaves and acorns) remained in good condition but required conservation-grade dry cleaning. The hand-painted foliage and fruit were dry cleaned and hand-highlighted. The stencil directly above the murals and the matching ceiling stencil were conserved. 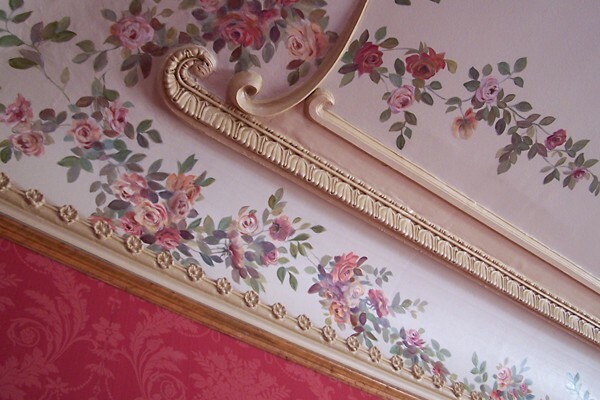 Molding on the ceiling was decorated with a color scheme that included thin lines of 23-¾ karat gold leaf. 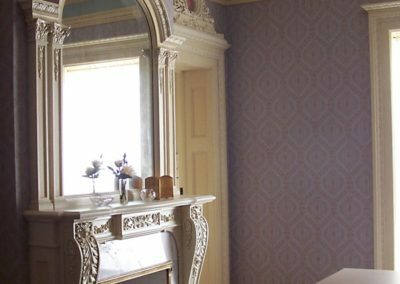 The elaborate wall stencil running throughout the second floor hallways and original base color had been painted over with a modern color. Several exposures uncovered a large, three foot high intricate stencil comprised of glazes and highlights. Stencils were hand-designed, hand-cut and hand-applied. 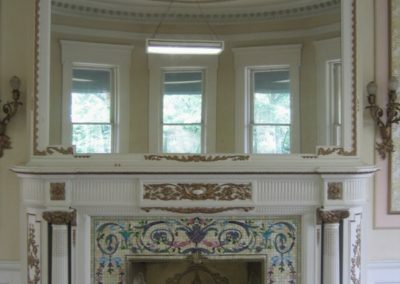 CSS replicated the stencil design throughout the hallway and on the upper rotunda of the stairway. 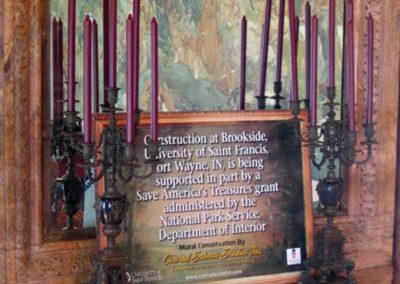 Historic photographs played a major role in guiding this restoration and conservation. 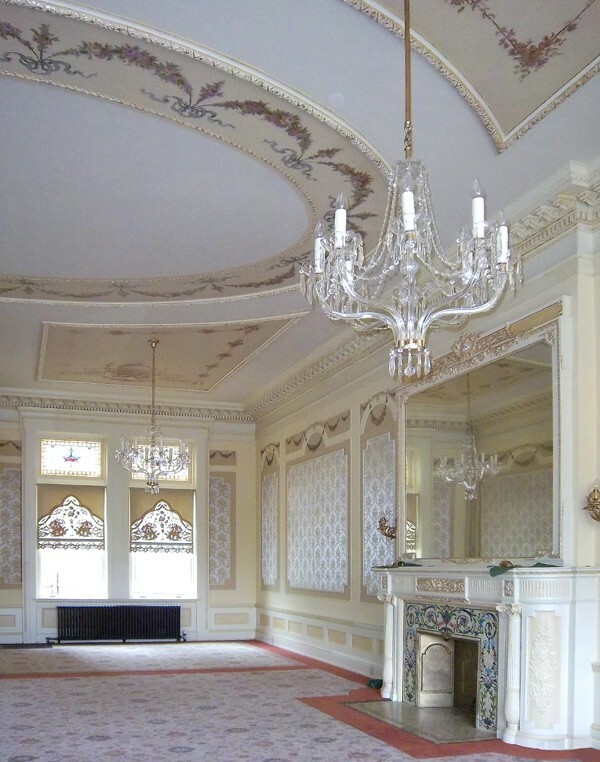 Photographs of the Ballroom were the only source to confirm the elaborate assortment of ceiling and wall stencils throughout the room. 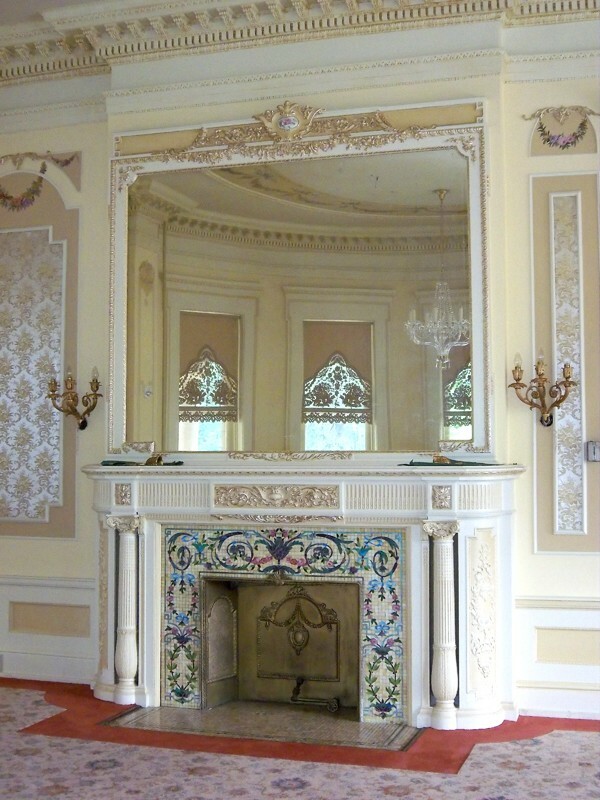 After an unfortunate fire, the decoration was substantially reduced. 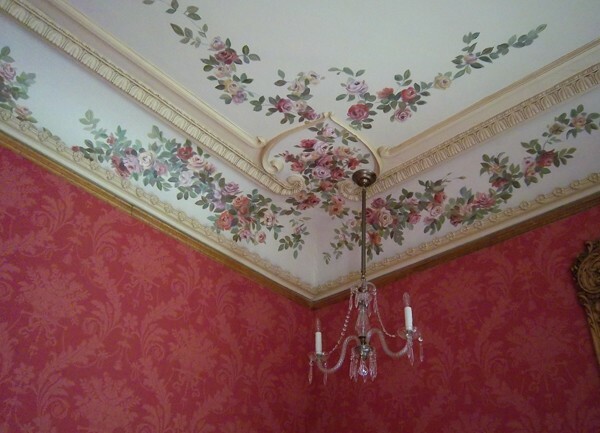 Apparent water damage repairs have further reduced the decorative scheme. 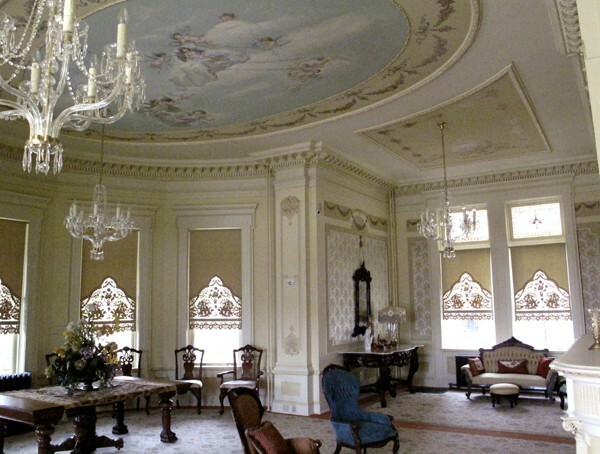 The ceiling stencil decoration that surrounds the rotunda and the stencil applied to the panel below the wall frieze were restored based on the influence of historically accurate original decorative schemes uncovered throughout the mansion. The Rotunda mural had been painted over with a significant lack of artistry. 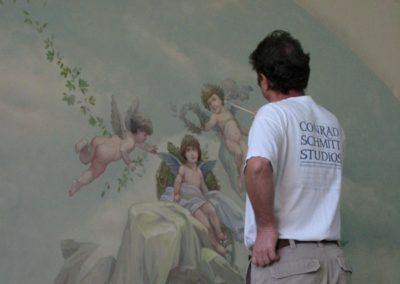 CSS conserved the historic mural depicting a host of dancing women. Before Conrad Schmitt Studios was hired to amend the architectural arts within this structure, the interior had become a mismatched collage of styles and varying quality. 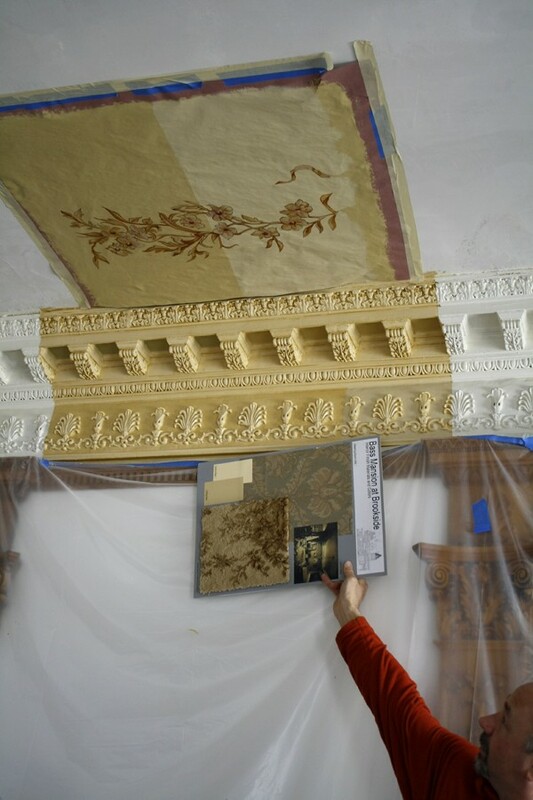 Today, mural conservation, stenciling, tromp l’oeil, glazing and gilding adorn the hallowed halls of the restored Bass Mansion.